Albertan voters are scheduled to head to the polls in the coming spring. 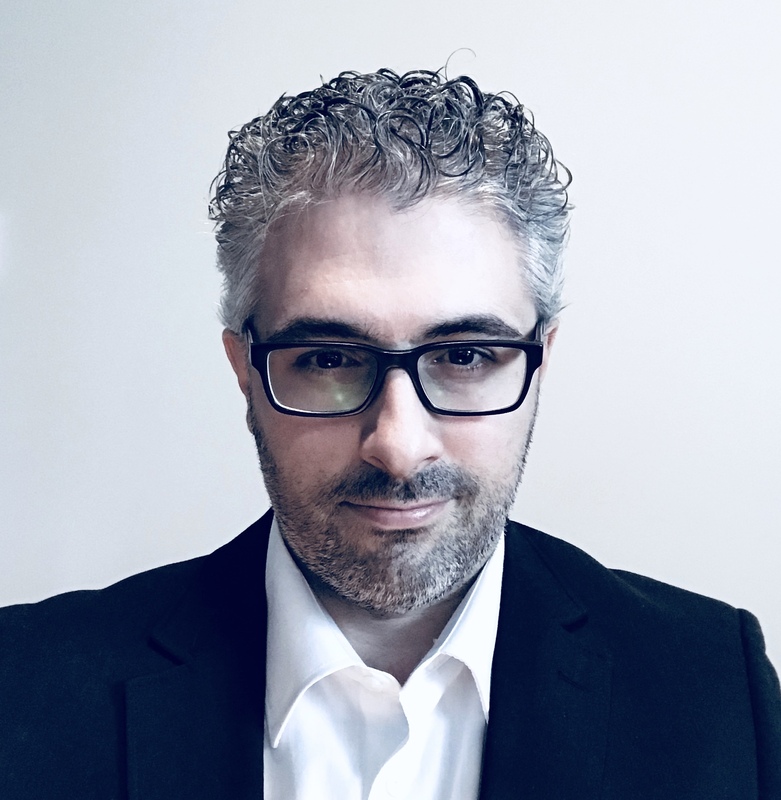 Rachel Notley, Alberta Premier since 2015, has a steep hill to climb in order to win reelection: not only does she have a record to defend, but she now has to face a united conservative challenger. 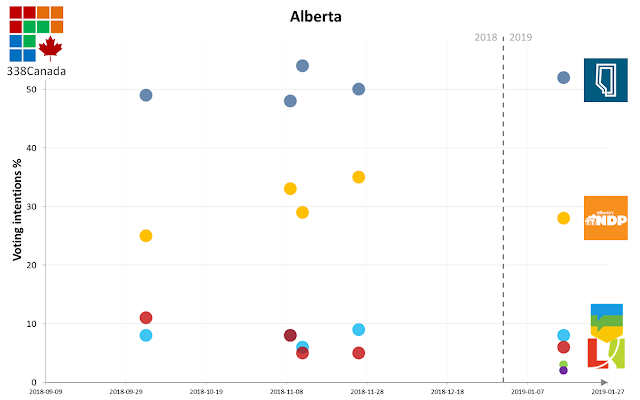 Since the election is still months away, data on voting intentions of Albertans is rather scarce, but polls conducted in the last six months or so all showed the same basic tendencies: 1) the NDP has lost some ground since the 2015 election (it is polling somewhere between the low 30s and high 20s), and 2) the UCP has, at least so far, amassed most of the PC and Wildrose support under one banner. 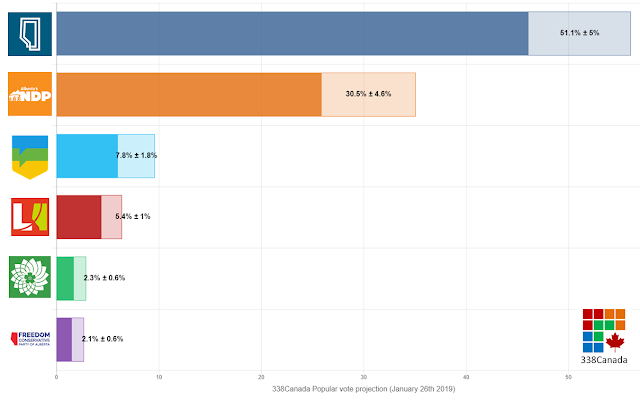 By breaking down polls by regions and taking into account the electoral history and demographics of Alberta voters, the 338Canada electoral model calculates voting intentions and seat projections - with uncertainty* - province wide. Unsurprisingly, the United Conservative Party leads the way with an average projection of 51% of support. Considering that, back in 2015, the Wildrose and PC parties had combined for 52% of the vote (24.2% and 27.8%, respectively), we can safely conclude - at least for the time being - that Jason Kenney has successfully managed the post merger right of centre party. Rachel Notley's New Democratic Party is currently projected at an average of 30.5% of support, down significantly from her 2015 result of 40.6%. Out of the 87 districts of the Legislative Assembly of Alberta, the UCP is currently projected to win between 60 and 80 of them (far beyond the threshold of 44 seats for a majority) with a seat average of 69.5 seats. The governing NDP would be reduced to its strongholds in and around Edmonton, and not much else. 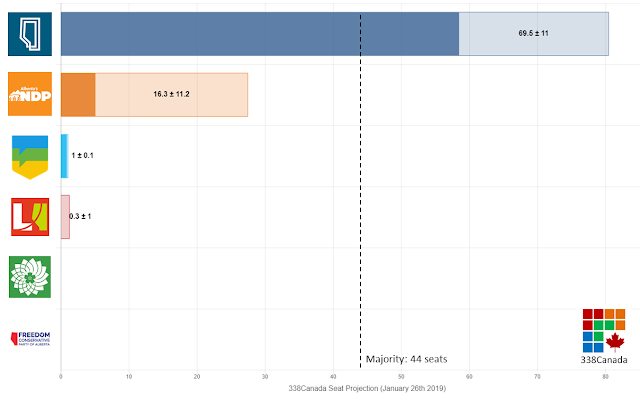 This projection has the NDP at an average of 16.3 seats. The model ran 50k simulations and the UCP won a majority of seats in every single one of them. There is no doubt, according to the data currently available, that the next Alberta election is the UCP's to lose. It would take both a dramatic turnaround of the NDP's fortune and several major stumbles by the UCP to change this projection. Of course, opinion polls do not vote, and there are still several months to go before the campaign begins. I will follow the numbers closely over the coming months and, of course, will update the Alberta projection as we approach election day.